I enjoy unbuttered popcorn as an evening snack – generously sprinkled with Spike seasoning. I just googled “spike” and had to go to page 5 of the search results to find my family’s favourite all purpose seasoning. We’ve been studying the variability in popcorn efficiency – defined as the percentage of kernels that fully pop into edible morsels, with consideration also to the price in the store. Did the Safeway brand leave more unpopped than the Superstore bulk kernels? I hadn’t been able to draw clear conclusions. However, recently I saw a “Buy one, get one free” offer for Orville Reddenbacher’s popcorn. I am aware of Orville Redenbacher’s fame as the icon of American popcorn. I don’t remember him from my childhood, perhaps because (a) I didn’t spend my childhood in the US and (b) Orville didn’t launch his first line of popcorn until 1969. His popcocrn costs TWICE as much as the house brands, so I never bought it until I saw this amazing offer. [Not that an occasional splurge in high-end popcorn would break our bank.] So finally, I came home with two jars of brand-name popcorn, ready to test in our hot air popcorn maker that is about as old as our marriage – 30 years. The result?! Do you remember the classic I Love Lucy episode when Lucy and Ethel were on the chocolate wrapping conveyor line? You will reveal your age with the answer to that question. In case you don’t remember, you must check it out here. Orville’s popcorn pops like crazy. It is positively violent. I am like Lucy trying to grab unpopped kernels to put them back in the popper, and popped ones that are bouncing around the counter. Kernels leap out of the popper, hit ground in the bowl of popped stuff, and explode in fury, sending several other popped kernels into the air like flying billiard balls. I normally wear glasses anyway, but my husband get out his protective lenses when he is making Orville popcorn. Popped and unpopped kernels flying around the kitchen. It is quite a mess but very exciting. I sprinkle Spike all over and take it off to my computer desk to eat while I blog. 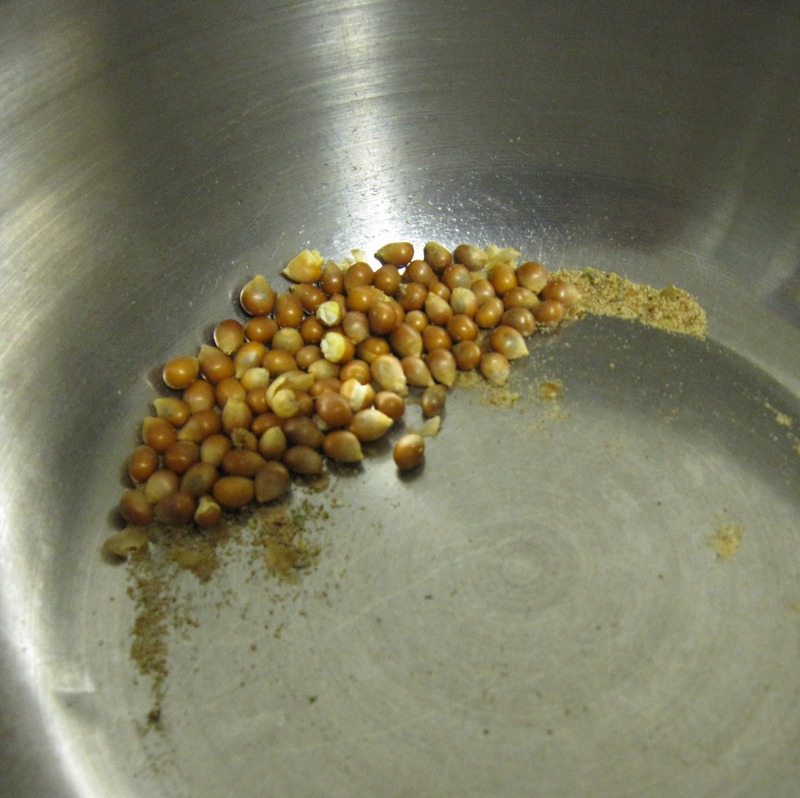 At the bottom of the bowl, I check how many unpopped kernels are waiting. For Orville’ popcorn, I regret to inform that about 30% (YES – ALMOST ONE-THIRD) are unpopped. My conclusion… Orville Reddenbacher popcorn costs twice as much and produces 30% less. It tastes the same. I will do the math for you: Orville Reddenbacher’s popcorn ends up costing 3 times as much as house brand, but it gives a very good show if your life is short (desperately so) in the excitement area. Could be that we would do better with a new popper. However, until I need and get a new one, we’ll stick with the house brands of popcorn. Day 4: Don’t forget your didgeridoo! Which of the 10 varieties of Spike do you recommend for popcorn? We use the Spike Original Magic, but I’ll be happy to try any of them. I don’t think I’ve seem more than 2 or 3 of the 10 varieties. I only eat Orville Redenbacher’s buttery microwave popcorn. Graham makes his in a pot on the stove in olive oil — yuck! Last year I bought a new $12 popcorn popper from London Drugs (the cheapest one) and I can say with certainty that your air popper is superior. It doesn’t pop any more kernels than yours AND it makes the popcorn taste stale! I have purchased a couple different brands of no name kernels from different stores so I know it isn’t my kernels. So IF you ever upgrade air poppers, don’t buy the cheapest one. I wonder how it adds a stale taste! Maybe that’s why mine is so messy with Orville’s wild stuff – the popcorn is pretty much exposed to the air at all times, and there is no place to get stale. As long as you keep the floor clean, even when you sweep it up, it tastes fine. 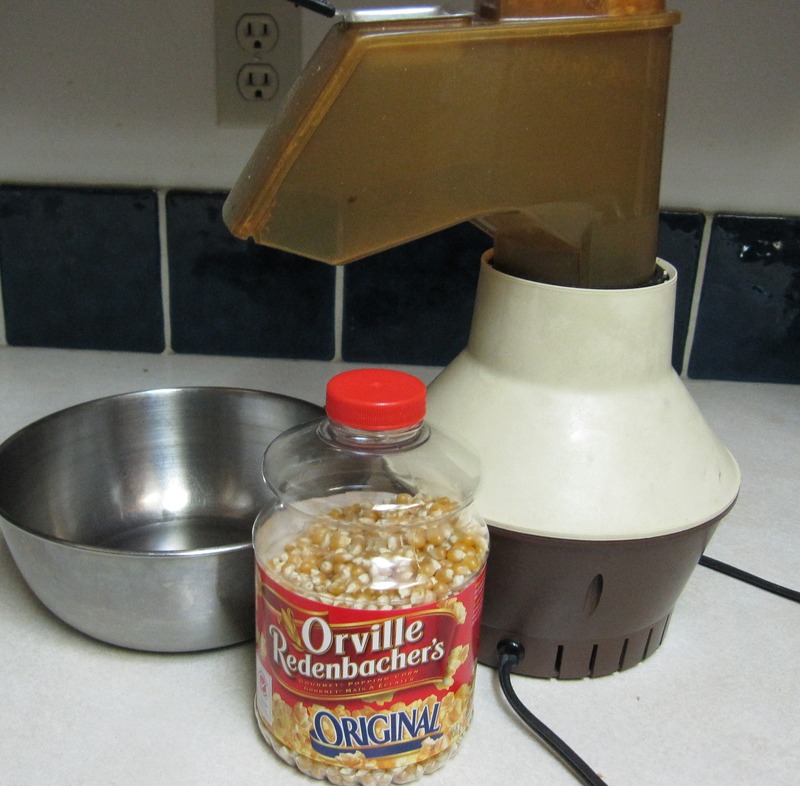 I too have experienced Orville’s wild popcorn and found the same, and it was with a newer popper. I wouldn’t go as far to say it has 30% less popped corn, but it definitely didn’t do any better, and I lost quite a few kernels to the chasm beneath my oven, cupboards and fridge. I started putting a cloth over the part the popped corn comes out and the bowl it was going into – to stop the popcorn from flying! That’s a good idea – to cover it. But it is quite fun to watch the craziness. OMG the Lucy reference made me laugh. One of the all-time great comedic moments. I think using safety goggles is mandatory. I took a popcorn maker back to the store the other day because my kitchen was a disaster after also popping OR popcorn. What a mess…and the actual number of popped kernels was a joke. 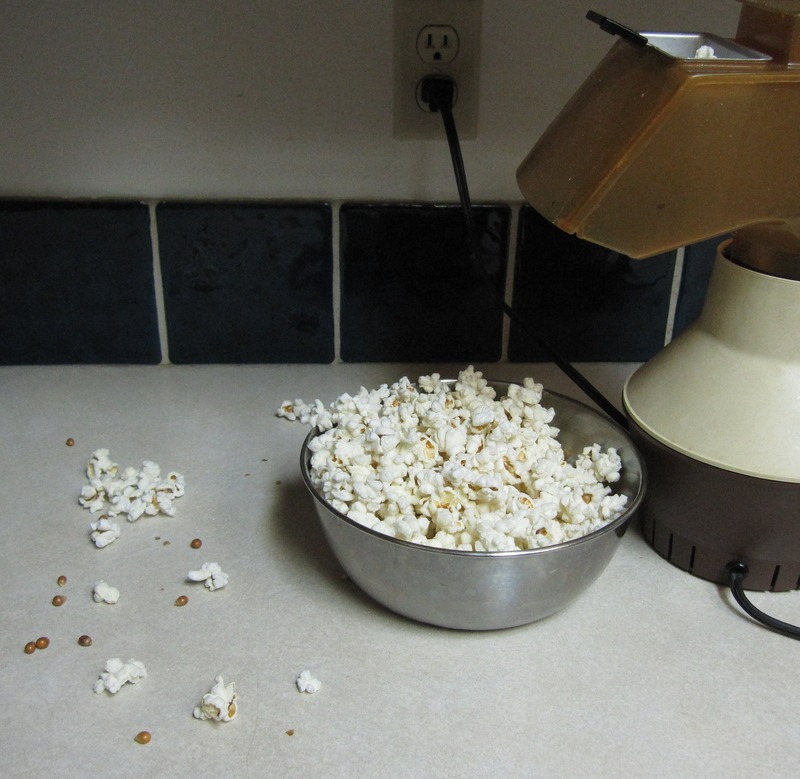 Clearly if you had been a more faithful follower of my blog, you would have learned in time that your popcorn was at fault, not the popcorn maker. Yes that Lucy episode was one of the all-time great comedic moments.